Call or email for a free estimate today! 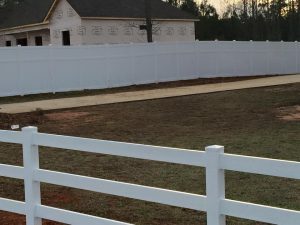 Vinyl fencing is popular in the Charlotte and Fort Mill areas due to its many styles, shapes, colors, and sizes. There is a vinyl fence for nearly every situation a homeowner could want. Vinyl fencing can do it all: pool fences, privacy fences, ornate fences, and even fences made to look like other types like wood picket fences. And it all comes with the added durability and minimal maintenance afforded to the homeowner by a vinyl fence. How do I know if Vinyl Fencing is right for my home? If you want a fence that will require the least amount of upkeep and maintenance while still looking beautiful for many years to come, a vinyl fence may be just what you’re looking for. The majority of privacy fences we install are vinyl. There are countless styles and shapes; several of them can be viewed on our Gallery page for further inspection. With vinyl, very little upkeep is needed to prevent deterioration, and vinyl can even mimic the look of a wood or aluminum fence, giving you the best of both worlds: durability and aesthetics. If color is your main concern, you may prefer the extended color options we’re able to provide with our vinyl fencing as opposed to the limited options of aluminum, or the added labor of painting and repainting a wood fence. Since vinyl is such a versatile material, we invite you to call us at (803) 548-5823 or email us using the form on this page if you have any questions about viable vinyl fencing options. Copyright 2016 - Resifence Inc.